Filipino actor, Coco Martin formally asks for defense against the viewing public, particularly to those who claim that the controversial circus act the actor took part in for Bench’s The Naked Truth fashion show last September 20 was disgusting. Because of the said incident, Coco’s camp called for a press conference, led by his legal counsel, Atty. Lorna Kapunan and manager Biboy Arboleda, September 30. According to Atty. 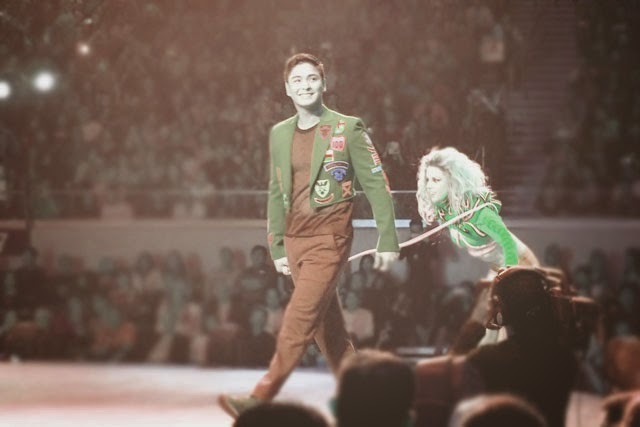 Kapunan, it was not Coco’s intention to anger or insult people who may find this circus act as inappropriate when he agreed to run on the fashion show, while holding a foreign female model by her neck using a leash. Coco said with all honesty that he was never comfortable with the concept of his circus act when the actor attended the rehearsal of The Naked Truth, one day before the fashion show took place. Unfortunately, the young actor was unable to grab a chance to communicate his thoughts about the concept and to add to it, the people involved in the fashion show’s production were mostly foreigners. Other than that, as a celebrity endorser of Bench, the Kapamilya actor had no other choice but to oblige to the show’s supposed theme. She added that the actor wanted to voice out his concern, particularly with the leash strapped on the neck of the lady model. Sadly, Coco failed to successfully voice out his thoughs due to the language barrier. It is said that Coco felt insignificant as to cause a scene and demand an overhaul of the entire segment. Coco initially didn’t think that his act as a circus master of a professional female model, who in turn acted like a cat, will end up in an intense controversy. The actor was saddened by the fact that he was involved in the incident that, according the the Gabriela Group, is an enactment of an unpleasant element that brings down women’s dignity. According to Atty. Kapunan, it is not in line with Coco’s personality to hurt feelings of women, much more that he is incredibly close to the love and care of his grandmother and female siblings. “Mr. Martin feels extremely sorry for what transpired and admitted that this incident taught him a major lesson to be more sensitive and mindful of the repercussions of his portrayals.” She said as she clarified that Coco, however, did not have the slightest intention on his mind to insult women by a single unfortunate act and that the young actor has high regard for women as he loves and respects his grandmother, mother and his three sisters.